Quartz. Black stainless steel case and bracelet. Black dial. Water resistant up to 10 ATM. 43,8 mm case. 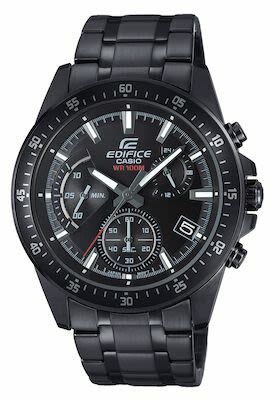 EDIFICE models combine understatement with dynamism. Perfect for business and leisure! High-quality workmanship and selected materials meet the highest quality standards. All models are equipped with a solid stainless steel case, scratch resistant mineral glass and a water resistance up to 10 bar.